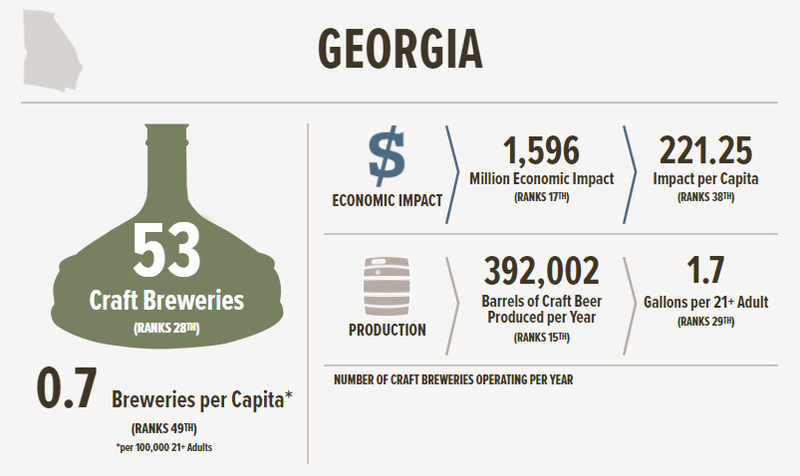 Georgia, like the rest of the U.S., has a booming craft beer biz. Back in 2011, craft beer constituted a mere 5.7% of all beer sold in the U.S. In the span of five years, that number more than doubled to 12.3% of the volume share. In Georgia the number of breweries grew from 21 to 53 within that same time frame. Whether the big boys at MillerCoors and Anheuser-Busch like it or not, craft beer is here to stay. 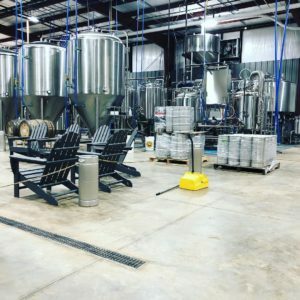 While the majority of craft breweries in the state are located in and around Atlanta, the industry is certainly starting to establish itself in the small towns of North Georgia, Dahlonega being no exception. Though not YET home to a brewery or brewpub (this could change in light of the passage of Senate Bill 85), Dahlonega has a number of places to grab a pint, six pack, or growler of your favorite craft beverage. In case you didn’t know, a growler is a refillable and reusable glass jug—typically 32 or 64 ounces—that you can fill with to-go beer or cider. 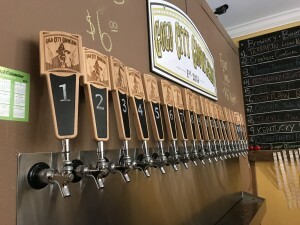 Gold City Growlers, located just off the square next to Jolie Day Spa, has 20 taps with tons of great craft beer, most of it local, and a cider or two. Gold City has by far the best selection of craft beer in Dahlonega. It gets better: Now not only can you take delicious craft beer to go, you can also try before you buy. Thanks to a newly passed local ordinance, you can grab a sampler of four delicious brews so you can figure out which one—or two—you’d like to take home. 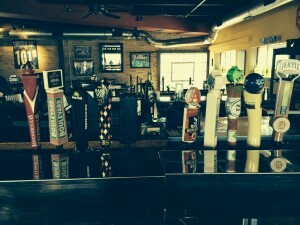 Gold City is also host to a wide variety of awesome events, like tap takeovers. During a tap takeover, Gold City will pour up 5-15 of a brewery’s best brews. Often they’ll send someone from said brewery to answer questions about the products and the best part… free merch (i.e. T-shirts, stickets, cuzis, etc.)! Their 20 taps are constantly rotating, so be sure to follow their Facebook page to find out what’s currently pouring and to see what events are going on. Who doesn’t love a good ole Irish Pub? 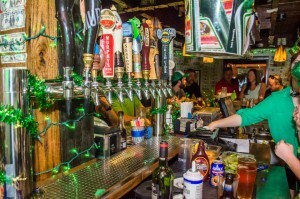 Shenanigan’s Irish Pub isn’t just a hole in the wall pub, it’s also a fine eatery with one of the best selections of craft beer in Dahlonega. It’s located in a historic home that burned in 2014. The pub has since been persistently restored and is better than ever! Grab a seat at the bar or take a seat outside on their pet-friendly patio. Suggested fare: You can’t go wrong with classic Fish and Chips. Note that if you want fries, you’ll have to specify. Their Southwest Sausage dip, known affectionately as “Crack Dip,” is a appetizer with which to kick off the evening. Gustavo’s is the best pizzeria in town… Well, it’s the only one in town, but the pies are nonetheless excellent. Food favorites include The Chaz, for those of you that like it hot, and their simple margherita pizza with mozzeralla, fresh basil, and tomato. Is it possible to fully enjoy pizza without a beer? Gustavo’s is always pouring up some of the most unique craft brews available. Be sure to check out their 10 oz. high gravity pours, but be careful! Some of these robust beers are in the 12-14% alcohol by volume range. Gourmet burgers and hotdogs? Really? Yes. Really. The burgers and dogs at Spirit’s are made with only the finest ingredients uniquely combined in amazing ways. Take for instance the Beearded Goat with goat cheese, green tomato chow chow, and balsamic BBQ sauce. How about the Another Rude Awakening dog chock-full of bacon, a cage-free friend egg, hashbrowns, and topped with white American cheese? What could be better than one of these delicious entree items? How about a delicious pint of craft beer in a supposedly haunted setting (Get it? Spirit’s)? 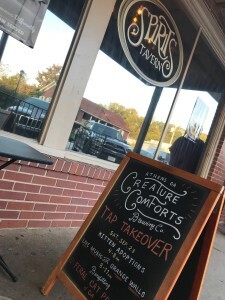 Grab some Creature Comforts Bibo, Sweetwater 420, Three Taverns Cranberry Sauced, or Monday Night Drafty Kilt to go with the grub. Spirit’s also has great events like tap takeovers, stand-up comedy nights, and great Halloween parties. Oh, and their bartenders make some killer craft cocktails. 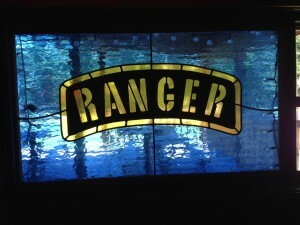 The Overhang is a local hole in the wall located on the grounds of Camp Frank D. Merrill, which is where U.S. Army Rangers complete the mountain phase of their training. There you’ll find 3 to 4 craft brews served in either pints, pitchers, or 32 ounce “man mugs.” You can always count on them having Terrapin’s Hopsecutioner and New Belgium’s Fat Tire with one seasonal craft tap. Stick around after for some pool and darts, or take a stroll down to the Etowah, or check out the Black Hawk helicopters. So, if you’re interested in checking out the craft beer in Dahlonega, a good and safe way to do it is through our Craft Beer Pub Crawl Package. It includes visits to Gustavo’s Shenanigan’s Irish Pub, and Spirit’s Tavern (all mentioned above). Included with the package is lunch at one of the three destinations, two pints from each restaurant, and a 64 ounce growler to go from Gold City Growlers. Note that this package is only available to Lodge guests. 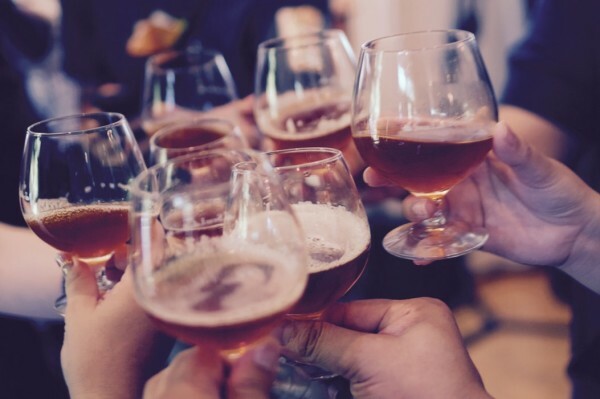 When you book your stay be sure to add the craft beer pub crawl package to your stay so as not to miss out on the best of craft beer in Dahlonega. If you have questions about the Lodge’s Pub Crawl Package email us or give us a call at 706-864-2337. While Dahlonega doesn’t yet have any breweries, there are four within an hour’s drive of Dahlonega. Thanks to the aforementioned SB 85, you can now enjoy a beverage on-site without purchasing a tour package. 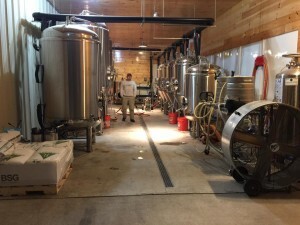 Tantrum Brewing opened in the early part of 2019 and is Georgia’s first agrotourism brewery. They cultivate their own hops and even wild yeast and other microbes right out back behind the brewery! Tantrum is an exciting addition to the North Georgia area. Notable brews include Poems @ Midnight—a traditional Berliner Weisse, Closer to the Sun—a hazy tropical IPA, and Life in the Shadows—an imperial stout. They’re located just 25 minutes from the Lodge. LNB First Batch from Left Nut Brewing on Vimeo. Located in on the east side of Gainesville, Left Nut Brewing is just a hop, a skip, and a jump away from the Lodge. Left Nut has been pouring up their tasty Lappland Blonde, Might Banyan Double IPA, American Obsession Pale, and a whole host of other beers since 2016. Stop by for good times with friends, and of course delicious craft beer. Fannin County Brewing Company is located in the quaint town of Blue Ridge. Owner Tom, inspired by a love of beer and frequent trips to Germany, decided to start homebrewing way back in the early 2000s, and opened the doors of his own commercial facility in 2014. Their lineup of beers include Rory’s Pumpkin Ale, Gose Beach (sour), Blue Ridge Lager, and 7 Hills IPA which can be found in some of Dahlonega’s restaurants or at their brewery tap room. Like Fannin County Brewing Company, Grumpy Old Men is also located in nearby Blue Ridge. The owners of Grumpy Old Men Brewing are quite un-ironically a couple of grumpy old men. These two retired guys decided to open their brewery in July of 2013 and have been cranking out delicious brews on their tiny nano-brewhouse ever since. Try these beers around town or at their tasting room: Aska Pale Ale, Devil’s Den IPA, and Hell’s Holler Porter. Cherry Street Brewing Cooperative is located a little less than an hour south in the northern part of Forsyth County. They’re known for incorporating strange ingredients including coconuts, pineapple, cherries, lime, and wild yeast and souring bacteria. Don’t miss out on their seasonal barrel-aged releases including their Bourbon Barrel Coconut Porter, Bourbon Barrel Quad, Red Rum Quad, and Friend of the Farmer Pumpkin Pie Porter (to name a few). While Cherry Street is a relatively small operation, they gained national attention when they were named Grand National Champion by winning three gold medals, a silver, and two bronze at the 2017 U.S. Open Beer Championship. Jekyll’s name comes is a throwback to the first brewery in Georgia which was located in colonial Georgia on Jekyll Island in 1738. 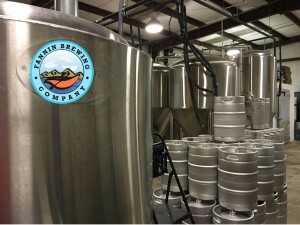 While their beers can be found at most of Dahlonega’s restaurants, their facility is located in Alpharetta, about one hour south of Dahlonega. Beers to look out for: Hop Dang Diggity IPA, Southern Juice IPA, Cooter Brown, Big Creek Kolsch, Red Neck Christmas Stout. Like the other breweries in our list, a lot of the local bars and restaurants pour up their products. Check the full list of their beers on the website. Here’s a fantastic resource from Beer Guys Radio that shows you exactly where most of the breweries above are located on a handy map. Note: it does not yet include Tantrum. Dahlonega is home to two new exciting craft beverage producers. Mead, honey wine, is nothing new. As a matter of fact, mead is perhaps the oldest alcoholic beverage known to man, and it’s popularity is on the rise. Owner and head mead maker Blair Housley decided to “go pro” after years of making award-winning meads at home. His full-scale commercial operation opened its doors in 2017. Etowah contracted local artist extraordinaire the late Grant Searcey for their label art, and WOW are they stellar. 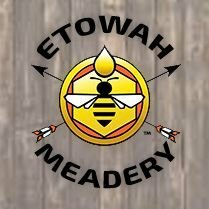 If you’d like to taste their mead, be sure to stop by their tasting room located on Morrison Moore Parkway in Dahlonega. Be sure to check their Facebook page for the tasting room hours. Dawsonville Distillery harkens back to the area’s moonshine heritage. Stop on by to try their unaged corn whiskeys and brandy! Again, Dahlonega does not YET have a craft brewery. That is likely to change given the passage of Georgia S.B. 85. This allows for direct sales from breweries to consumers. So, instead of breweries having to be able to produce enough to be profitable with having to navigate the the unnecessarily complicated web of distribution known as the three-tiered system, breweries can get their beers directly into the hands of their patrons. In other words, breweries can actually be successful and profitable at a much smaller scale. Theoretically, we should see a wave of new smaller craft breweries opening their doors in Georgia over the next few years. That being the case, check back on this blog from time to time. We hope to be able to update it to include newer breweries in Dahlonega and the surrounding communities. We hope to update this page as craft beer scene in Dahlonega continues to grow. If you feel that we’ve missed anything, feel free to reach out or comment on the blog!